"God, please bless my family to be a band for Your glory and may they have a passion to serve you with all their hearts." It was a simple prayer, but an earnest one prayed many, many years ago. Bill McClurg was a man with a holy obsession to share the Gospel message with anyone willing to listen. He had a deep personal conviction that it was God who had saved his life off of a sinking naval ship that was the target of a kamikaze attack during World War II. Following the war, with a new lease on life and fresh perspective, Bill McClurg knew he would live the rest of his life following the orders of the Captain of his salvation. Those orders written in red words in the Good Book rang out in his heart like a naval ship horn every day. "All power is given unto me in heaven and in earth. Go ye therefore, and teach all nations, baptizing them in the name of the Father, and of the Son, and of the Holy Ghost: Teaching them to observe all things whatsoever I have commanded you." As Bill looked around the city that he lived in and saw what looked like a distress call on the faces of the people he'd meet everyday; it inspired him to look for ways to go into the world and share the good news of Jesus Christ with others. It wasn't before long, that Bill discovered how powerful a tool it was to share this message of hope through music. Every song he wrote and shared became like a life raft that he was throwing out to some shipwrecked soul. His faith was growing and his devotion to reach more and more people increased daily. But there was a problem. His band-mates were not as devoted as he was to the mission to reach others for Jesus. It was hard to find reliable band members. It was even harder to keep band members involved due to outside personal time constraints and schedule conflicts. Bill was finding himself at an impasse. He knew that the Lord had placed this ministry of music on his heart; and that there was a sense that God wanted Bill to commit more of his time and energy to developing songs and booking tours for the band. But he knew in order to do it, he wouldn't be able to move forward by relying on non-committed musicians. He needed God to provide another way, and God would provide another way. Bill McClurg was a family man, and the command by his Captain to go make disciples was always applied to his family first. Having become a pastor, Bill knew that getting people involved to serve in the Lord's work would help them grow stronger as disciples of Jesus. One day the thought occurred to him that if he made a band comprised of his children (Bill Jr., Mary, and Martha,) he'd have the best of both worlds; a steady band and a group of people he could pass a legacy on to. Pastor Bill McClurg fell to knees and prayed, "God, please bless my family to be a band for Your glory and may they have a passion to serve you with all their hearts." Soon after, the McClurg Family Singers were born. Pastor Bill McClurg's prayer to have a family band that blessed others was honored and the McClurg ministry had never been more fruitful. They were traveling regularly to share a unique Southern Gospel Sound that was born and bred in Buffalo, New York. The lyrics drew heavy inspiration from the teachings of Jesus, and often touched on hopeful themes about Heaven and eternal life. The vocal style of the group was rich with harmonies, making the McClurg Family Singers a sought after and popular act in the regions that they traveled to. Concert goers would fill the pews to hear the vocal group fill the sanctuaries with their music. They released albums of the music they wrote and performed. They were building a musical legacy. As time went on, the family grew, and eventually so would the band. Lead singer, Mary McClurg would marry the drummer of the McClurg Family Singers, Tony Hoisington. Mary and Tony had two boys, Anthony and Chris. From a very early age, Anthony and Chris were demonstrating a natural ability to play musical instruments and sing harmonies. Before long, Anthony and Chris became the youngest members of the McClurg Family Singers and would tour regularly with their parents, their aunt, and Pastor Bill, whom they affectionately referred to as Pappy McClurg. Chris and Anthony's time spent on the road with the band were formative years that would shape their view of what it meant to serve the local church. They learned how to lead congregations in worship. They learned the importance of loving church families through prayer and acts of service. They learned that worship music was a way to unify the Body of Christ, regardless of denominational affiliations. And most importantly, they learned from Pappy McClurg that there was a Captain of Salvation that gave them life rafts in songs that had the power to save the lives of the people that heard their songs. Soon after, Anthony and Chris, now known as Brothers McClurg would sign a record deal, and would release the "Alive" EP and the "Join in the Sound" full length LP during their time with the label. During this time, Brothers McClurg earned the respect of some of the music industry's biggest songwriters, worship leaders, and magazine editors. After more than two decades of singing together, Chris and Anthony's ability to harmonize set them apart from every band in the contemporary Christian music genre. Their comprehensive history with church music led to many invitations with high profile songwriters in Nashville. They were having new doors open to them to tour nationally in support of their releases. The album "Join in the Sound" broke the top 40 on the Billboard music charts. Nevertheless, after two releases with the major label, they were discovering that the popular sound being produced by Nashville based producers didn't fit perfectly with their natural tendencies towards Southern Gospel roots music. Suggested contemporary production aesthetics to fit radio formats felt like too much of an artistic compromise, so it was finally decided that in order to preserve artistic ownership and the family musical legacy, Brothers McClurg would part ways from the label. During their time on the Nashville label, Brothers McClurg cultivated a loyal following, and a strong fan base. An independent record label based in Watertown, New York almost immediately approached Anthony and Chris about representing the Brothers McClurg's new music; and before long, Brothers McClurg was with a new label. Brothers McClurg would release three albums in the time to follow; a Christmas album called "Goin' Back to Bethlehem," an Americana style worship album called "Home," and a revisiting of their Southern Gospel roots with the album "Around the Mic." The recording of the albums and subsequent touring would see an additional member join the band that would become an integral part of the sound of Brothers McClurg. Lead guitarist and multi-instrumentalist, Jeremy Thompson added a fresh dimension to the bands sound both in studio and live; and gave a new excitement for the band as they looked towards their future. For the recording of "Goin' Back to Bethlehem," Chris, Anthony, and Jeremy, along with their long time friend and recording engineer, Paul Mitro, rented a warehouse space in Batavia, New York to record the album. They brought in a recording console, a few mics, and some instruments, and proceeded to record their Christmas album during the hot summer months in a warehouse space with no air-conditioning. Regardless of the sweltering conditions, and limited professional equipment; Brothers McClurg recorded a Christmas album that became their most critically acclaimed work to date. And based on the critical success of that album, something happened that no one in the band saw coming. They were receiving regular requests from other artists to come record at their new "studio." Over the next two years, over forty different artists, bands, and creatives came to the warehouse in Batavia to record their music. They began to regularly invest in the studio's equipment. They finally decided to name the studio Old Bear Studios. With Chris' increasing penchant for producing artists and inventive approach; Jeremy's ability to execute on Chris' ideas while incorporating his own signature musical style and dynamic musical elements; and Anthony's ear for interesting instrumental parts and engaging melodies; a new sound began emerging from Old Bear Studios. Because of Brothers McClurg's professional musical network, the studio was getting the attention of higher level artists and songwriters nationally to come record with them. Editors at worship leader websites and magazines were contacting Chris, Anthony, and Jeremy to find out about what was happening in the creative community at Old Bear. Soon, artists that Brothers McClurg were recording at Old Bear Studio, were being invited to song write and go on tour. Chris, Anthony, and Jeremy could see that God was building a creative community around them in a very natural way. Feeling led to affirm the artists that they worked with and provide a home for their music, Brothers McClurg formed a new record label called Old Bear Records. In just a few short years, Old Bear Records has released multiple Christian music albums that have connected new artists with what they describe as "the upstream sound" to listeners across the world. In addition to all the exciting developments at Old Bear Records, Brothers McClurg continues to travel and share their music nationally; bringing their live ministry to hundreds of churches coast to coast and sharing the stage with some of Christian music's biggest acts. They have developed a reputation as some of the most talented and authentic live acts in modern Christian music which gives them continued invitations to play for Christian music promotions, churches, Bible institutes, and conferences. Because of their passion to develop worship leaders and songwriters, they are regularly invited to the most respected worship conferences in the world. Their insights into worship and songwriting can be heard or read on some of today's finest worship podcasts, magazines, and websites. 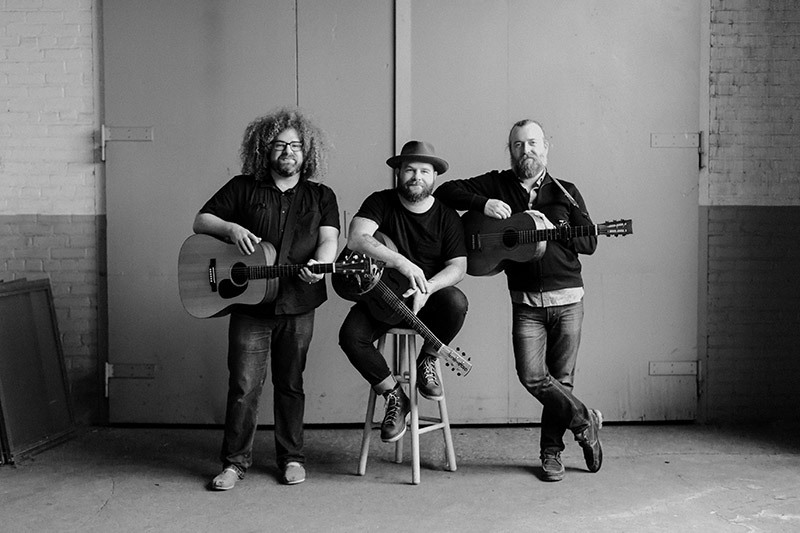 As Brothers McClurg looks towards the future, they will continue to bring fresh vision to a musical and ministry legacy spanning three generations with their own version of "the upstream sound." Be sure to follow Brothers McClurg's Spotify account, add your favorite songs to your playlist, and share them with your friends on social media!